Secondary oven capacity 5.0 Cu. Ft.
Total capacity 10.0 Cu. 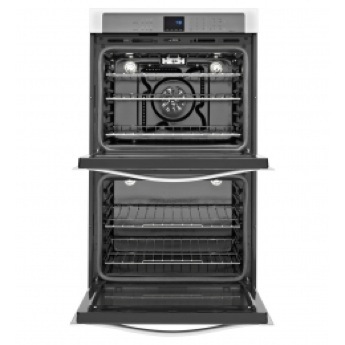 Ft.
Primary oven capacity 5.0 Cu. Ft. Absolutely LOVE this new oven! We were worried about the loud noise as was detailed in a lot of the reviews. The fan does run the entire time on the convection bake but it is not loud at all. Makes a nonstop whistling noise while in use that will drive you crazy. But at least I never worry about accidentally leaving it on! Replaced an old whirlpool double oven with this new convection. The fan is very loud and runs considerably longer than I expected during cool down. Also, the glass has a blue/green tint that alters the ambiance in the kitchen. 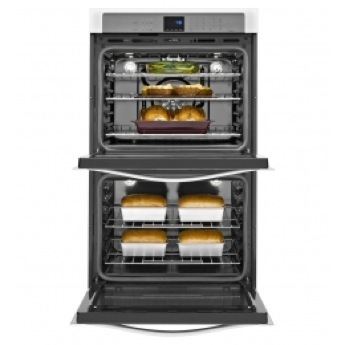 "Read about this oven in Consumer Reports )Their ``Best Buy``( and we love the oven!" The oven is great except for a fatal flow in the door where grease can get down into the door and cause streaks on the glass. The only way to clean it is to take apart the door which is difficult. It is not covered under warranty. Beautiful oven. Clean look. It does take a long time to preheat. But that can be expected with the concealed heating element. Not noisy as others claim. Installation was a breeze. My wife is still learning the controls and can't figure out why the oven turns off when she turns off the timer. I like the variety of ways you can arrange the racks. 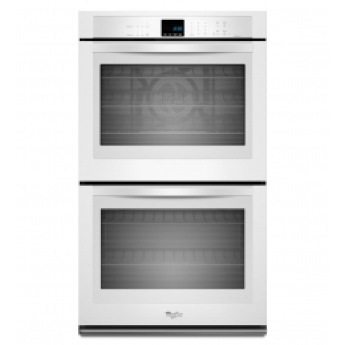 "I have a HUGE family so this oven is perfect for me. It has a lot of space which I need. I looks stylish and it works fast. great product!"